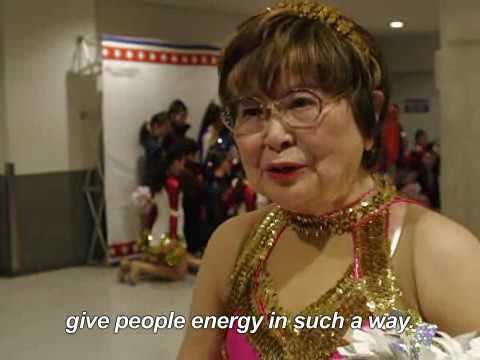 Chiba, Japan (AFP) -- Strutting her stuff in a gold-hemmed mini-skirt, white leather boots and shaking silver pom-poms, octogenarian Fumie Takino has discovered her elixir of youth -- cheerleading. Takino and her troupe of spirited grannies tweak the nose of old age, even if their rambunctious routine to the song "Dreamgirls" leaves them painfully out of breath and their pink tank tops dripping with sweat. Takino, 84, has spearheaded the group of more than 20 bubbly seniors for some two decades, founding the "Japan Pom-Pom" squad after being bitten by the cheerleading bug -- despite it traditionally being the preserve of teenage girls -- in her sixties. "You have to be 55 or older," Takino told AFP, referring to the qualification for joining her team, the average age of which is 70. "Once you hit the age of 70, you have to admit it's downhill," she said with a smile, before adding: "We've come a long way in 20 years!" Japan is renowned for its spritely pensioners: women live for an average of 87 years and men to 80. But the average "healthy" lifespan is 10 years less for both sexes, meaning many suffer physical and mental ailments in the final decade of life. Takino, however, insists that her glamorous hobby has helped mitigate the effects of ageing -- making her feel mentally and physically more agile. She took up the activity when her relationship with her husband began to falter. She explained: "My marriage was not going well. I put up with it until my children got married." Takino added that she would not have had the confidence to pick up the pom-poms in her youth, explaining that she became emboldened by changes she made in middle age. The first came at the age of 53 -- when she packed up and flew to Texas to study. It was against the wishes of her ageing mother, but she says her children supported her decision. After completing a master's degree in gerontology at the University of North Texas and a work placement in New York, she returned home with a new-found sense of freedom. But it was actually in Japan that she encountered the quintessentially American activity of cheerleading with its eye-popping array of moves, from human towers, somersaults and back flips. It took off in Japan around 30 years ago, though remains rare outside school and university environments. "It blew my mind," said Takino, who immediately rounded up five friends to start her own troupe after first hearing about cheerleading. Two decades later, the grannies gather each week for intense training -- and while they don't overdo the acrobatics, they take practice seriously, even analysing videos of themselves to improve. Earlier this year, the team celebrated its 20th anniversary by performing as guests at Japan's annual United Spirit Association (USA) Nationals competition, where mostly high school and university teams compete. Given their age, some members have to drop out for health issues or to care for ageing spouses, but new recruits are easy to find. Shinko Kusajima, in her late sixties, says forging new personal bonds is a huge attraction. "When you get old, you keep losing friends," she said at a practice where she hoped to become a new member. "But you always have mates here to share a good time."